So green, and sunny at last! According to the weatherman we’ve had thirteen straight days of “measurable precipitation.” I’ll say. 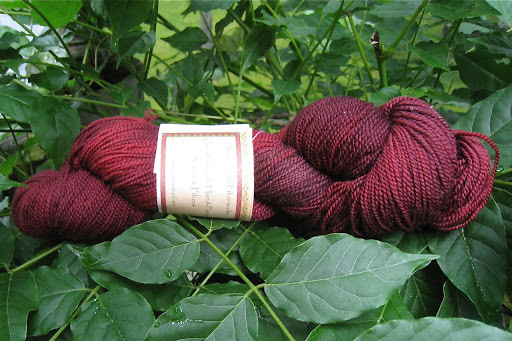 Nestled in the green (earlier today, before the sun came out) is the yarn I’m using for my Hedgerow Mitts. The Knitters Review Greatest Hedgerowalong on Earth starts tomorrow, so I wound my skein today. I might have started knitting, too, but I’m not telling. I hope the weather gets better soon. Summer is almost here, after all. It seems like it’s been weeks since we made it out of the 60’s. The bookstore is getting busier every day, and we spend a lot of our time helping customers choose beach reads, so at least somebody has confidence in the weather! I love being able to keep the windows open, but there are drawbacks. My neighbor, whose yard is about 200 yards away, has outdoor speakers. My neighbor also, it seems, owns only one CD — Elton John’s Greatest Hits. To top it off, my neighbor really loves to listen to tunes by the pool, because sometimes Elton John may as well be in my living room, well into the late evening. I tune it out and laugh it off most of the time, and at least I don’t have to listen to it every day, but every once in a while “Benny and the Jets” sends me right over the edge. And the other day I found myself humming “Candle in the Wind” in the car on the way to work — not a good sign! Now, isn’t that just the best wish? The nice thing about lots of rain is that the greens are so beautiful. But they're even better when the sun comes out now and then. 🙂 That yarn is gorgeous! I love the colors. Such a nice wish! That is indeed a wonderful wish. I wish that for you also. Beautiful yarn and a wonderful wish! That neighbor, though, GRRRRR. what a fabulous story about your wish giver. Silly neighbor – perhaps you could buy him a new cd as a gift? Beautiful yarn and a lovely wish. That IS a nice wish. And coming from such a person, it's a wish you can believe in. (Pardon the dangling preposition. )Let's hope for summer to arrive. And, just perhaps, an anonymous package containing new, more palatable music, to reach your neighbor's doorstep? Now THAT is a wish I like. A lot. I could accept another 44 years of Jane, and of Mom, and of Aunt Charlene, and and and. We had neighbours like that for a year. Music just a little too loud and raging fires in their fire pit all summer.Fortunately they moved.I wish you the same good fortune. How did I miss this new post for four days? Hmm…The yarn looks lovely. Love the colorway! Can't wait to see progress on the mitts.Our personal weather station here at home registered only 2 days so far this month without any kind of precip. Granted, some days it was only a trace, but still. We just had a little thunderstorm go over this a.m. This will be the second day for air conditioning.Maybe you could leave a copy of your favorite CD on your neighbor's doorstep and gently suggest you'd like to hear something different for a change? :)Her wish for you was wonderful. Add my wish right on top of hers! only one thing to say:Buh Buh Buh Benny and The Jets!